The original BOB, the YAK trailer carries up to 70 pounds of groceries, laundry, or auto parts (for when your car breaks down). It attaches to virtually any bike's rear wheel hub, including nonstandard 29er and tandem wheels, creating a low, stable, center of gravity; improved performance; and excellent aerodynamics. YAKs are compatible with full-suspension bikes as well as those that have solid-axle hubs. Yak 28 trailers are for 28" wheels, 29er mountain bikes, and 700c road bikes with full wrap fenders. Santana version designed for 160mm rear spacing of Santana Tandems. Yak Plus models include the BOB Dry Sak. You are invited to join our 2010 planning process! We meetweekly on Tuesdays from 7-8:30pm at the Yay Bikes! office (82 East 16th Ave). You are not required to attend every meeting to be involved; contact Austin to learn more and join the mailing list. We hope you’ll give some thought to where you belong on the planning team and come prepared to share your ideas! Also, please consider making a tax deductible contribution to Bike Month activities via our friends at The Enrichment Association(just put “Bike Month” in the subject)! Yogi Diana Pearson has agreed to teach a yoga class* that addresses the body issues specific to cyclists! The course begins Feb 13, 10:30am to 12pm at Summit on 16th. Classes are $10 each and will run for as long as we have interest! RSVP to Diana to join the class. *Mountaintop yoga bike poses not featured…yet…! One goal for Yay Bikes! is to support people as they become advocates for the kind of cycling they’d like to see in Central Ohio. Starting this month, we’ll highlight the successes of these “emerging advocates” in this new feature. First up: Andrew Hulvey! 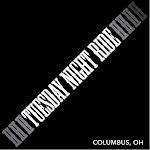 Andrew has been on the cycling scene in Columbus for more than two years, working as a Pedal Instead volunteer, organizing and leading Critical Manners rides, and generating conversation on our forums. But over the past few months, Andrew has stepped up in a big way to become the primary voice for Yay Bikes! online (see his consistent, intelligent, and open-minded commentary as “lifeontwowheels” on Yay Bikes!, The Dispatch, ColumbusUnderground, and many others). His quest to understand and articulate the needs of local cyclists recently culminated in an outstanding analysis of the Hilltop Mobility Plan and subsequent relationship building on Columbus’s West Side. My epiphany came when was trying to make a large castor wheel for a parade float. I drilled a hole in a scrap of redwood 4x6 lumber and mounted an old Campagnolo bike headset in it. I installed an old bike fork through it and attaching a wheel to make a BIG castor wheel. But many other possibilities emerged. I was also immediately captivated by the incongruous look of an old piece of lumber sporting a fine headset and supporting a fork and wheel. The first ever cycle computer specifically designed for commuters and those who ride for transportation, errands, and utility. Critical trip details make the CatEye Commuter Computer the best option for making your rides stress-free. Estimated Time of Arrival, clock, temperature, and back light help you stay on schedule. The new larger font size makes it even easier to read trip details with a quick glance. Carbon Offset information is included along with standard computer features so you will not only feel better from the ride, you’ll feel better about the ride. The Carbon Offsets are computed by using a fixed 150g/km or 240g/mile figure and multiplying it by the distance ridden. It tracks it in real time and shows day to day, week to week, month to month and total carbon saved. The innovative FlexTight™ bracket mounts quickly, securely and without tools to virtually any handlebar or stem. The tool-free speed sensor mounts effortlessly to any standard fork. Bike vs London Underground - Bike won! What is faster – the London Underground or a bicycle? Everyone can remember the excellent Top Gear episode where Richard Hammond travelled by bike to London City Airport and beat his co-presenters who between them used a car, a boat and public transport. It made for a thrilling episode and was a great victory for all those who support cycling. I however wanted to take this experiment a little further and try it out in some popular destinations in London you or I may travel to daily to see which of the two might win. I made the test as fair as possible by starting and ending the journey standing on the same spot. For tube route planning and estimating journey times I used TfL’s journey planner. Above ground I used Bike Route Toaster to plot a suitable route. I then exported the data to my iPhone which is mounted to my bike using the Bicio bike mount. I'm an outsider. "The Gubbins Experiment", my vow to take no car journeys in 2009, either as driver or passenger, has made me so, and in two particular ways. Although I'm already a cyclist and public transit user, I can't fall back on the car to 'fill in the gaps' when I would like it to. It's forced me to adopt a more self-sufficient, local frame of mind. The workable parameters of my world have begun to shrink in accordance. The combustion engine represents the something-for-nothing way of living that dominates our modern world. It's an existence dependent on borrowing from the past (fossil fuel energy) and from the future (the health of the planet). In exchange for ease of movement now, we commit the Earth to ever expanding ecological debt and we invest ourselves in systems with no future. With peak oil looming, the mass oil-based mass private transport system isn't going to work for much longer. The reality of energy simply doesn't work the way we have been living. Reality with a future will be intensely local. Food, materials, services, infrastructure, transport: without oil to propel us around the globe, all of these will shortly begin a re-sizing from state, national, and global back to local. We might as well start by experimenting with life without our cars now. The Gubbins Experiment has made me intensely aware of this need. As an outsider looking in, I see so clearly now how doomed the current transport system is. As an outsider, I've come to realize how violent the act of driving is. Our public spaces, the areas outside of our buildings, have become death strips populated by dangerous chunks of metal that threaten to take out anybody who puts a foot wrong. The alienation and dehumanization of society owes much to the combustion engine. It was not what we were promised at the dawn of the mass automobile society. Picture in your mind a world where car use is an exception not a rule. Imagine quiet, clean streets of friendly faces and moderate pace. You cross the street wherever you like, your children are free to play next to the road, birdsong is once more audible, the streets become safe once more, you start to see the same people again and again and the first shoots of community begin to grow. Think of what effect all this would have on your daily peace of mind. That could one day become a reality if we wanted it to be so. I'm very critical of what world cars have helped create, but I'm less condemnatory of drivers. All people, including drivers, act according to their level of understanding and with the field of view afforded to them. As an ex-driver, I relate to the view of cars as indispensable in the modern age (even though I now see the error of such a view). I understand how firmly entrenched people are in the car world and that many couldn't simply walk away from their cars. As a result, it's such people who most need to start talking about post-car existence. My inventory lacks a crystal ball but I'm betting that such a time will come. Let's start talking. Pedalite 360 Degree Visibility Pedal Lights are the unique battery-free pedal lights for bicycles that have been designed to make cyclists more visible to motorists day and night from any angle including the side. When cycling it is vitally importance to being seen from the side by other road users and to ensure you have lighting on a bicycle even during daylight hours for when you ride through a shadow or a cloud comes overhead. Pedalite pedals also help cyclists create their own virtual cycle lane as motorists naturally give cyclists with Pedalite pedals a wider berth and distance, increasing their safety. As soon as cyclists start pedaling the Pedalite pedals uniquely harvest and store a small amount of energy from the bicycle so the lights continue to flash when the cyclist is freewheeling or has stopped at a road junction. The original model, around in some form or another since Seagull’s humble beginnings in 2003-ish. Totally waterproof. Light and comfortable, yet still tough as nails. Comes with a few essential features, so you can add the options you need for what you’re going to use it for. Available in different sizes for different sized bodies and different sized loads. And since all Standards are built to order, we can make it in a slew of color combinations, as well as with custom art. 1000d Cordura exterior.Waterproof and extremely abrasion-resistant. You pick the outside colors - we have tons. 18 oz vinyl interior. This is the ultimate in waterproof fabrics. This 100% waterproof liner floats inside of the shell and guarantees that no water will seep in through the seams. Two deep pockets on the outside under the flap. These are great for holding beer, clothes, tools, plague rats, and anything else you can figure out to put in there. No pockets in Small size. 1.5 inch Duraflex buckles to hold the flap down. More durable and easier to release than the usual 1” buckles that most companies use. Combined withindustrial 2” Velcro (seven colors), you won’t find a more solid closure. A completely adjustable main strap with an under-arm (anti-sway) strap.Angled for maximum comfort. I work very hard to make sure that we have the best strap designs that exist. Easy to adjust slim buckle on all sizes except Small, which gets a hard plastic buckle. A completely closing interior pocket(12” x 6”). Completely customizable. Check out the pockets and straps & flaps options. Jimi™ wallet is a really handy and stylish way to carry your essentials and free yourself from the clutter and bulk of the traditional wallet/pocket book. It's compact, water resistant, and translucent - as much at home in a hipster's pocket, a busy Mom's diaper bag or around the neck of an exec. breezing through airport security! Already a hit with the cycling, motorbike and snow sport community, Jimi wallet's a smart urban accessory and it's great in the great outdoors. Students we've heard from say that they love it at school because it's translucent, hangs on a lanyard and is great for showing ID. Jimi wallet's also an award winning, US-made product that's being sold everywhere from Lance Armstrong's new bike store in Austin, TX to tiny boutiques in Tokyo. And to top it all, Jimi wallet is manufactured from 100% recycled and recyclable materials, and 1% of its sales revenue is invested in the environment. And priced at under $15, it makes a great gift anytime of year. So break free and get yourself a Jimi! Saturday's forecast was for mid 40's and a peek of sunshine. Well, I saw the peek of sunshine and it was in the upper 40's and hit 50 briefly when the sun made an appearance. I decided to ride the Ridge Runner route which has 2000+ feet of climbing and is 60+ miles. A slight wind out of the southeast plagued me for most of the ride, but I had a tailwind heading from my house north to New Albany. As I headed east toward Granville I had a slight wind hitting my face, but as the day wears on a slight wind takes its toll. When I stopped for a break a big diesel pickup truck roared by and on the back in vinyl letters it said, "my carbon footprint is bigger than yours," which I thought was quite funny in a sad and ignorant way. I stopped at the Fredonia Mall and Store for a drink and snack. I don't know why they call it a Mall because it is a tiny gas station with old school analog gas pumps and a little grocery store. People always ask me about my Jimi wallet when I look for my debit card. The cashier at the store commented she liked the orange color and how it held cash and cards. Check out their website because it is a pretty nice wallet to carry when riding since it is minimalistic. I then looped down to Granville and made my way back west with a slight tailwind. I noticed on that section of the road that drivers will give more clearance for roadkill than a cyclist. When I turned south I again had to contend with a headwind. Finished with 62.5 miles and averaged 15.1mph. Half-way through yesterdays stage, as I was struggling to hold the Yamaha upright in a frightening cross wind that must have blown most of McLaren Vale's top soil into my eyes and mouth, I reflected on some of the commentary I heard earlier in the day as we were preparing for the start of stage 4 in Norwood. I was thinking that it may be true that TDU has come a long way since its first edition in 1998 however its success is largely hinged to the timing, structure and format of the event. For starters, it takes place in the beginning of the cycling season during our summer, when most of the northern hemisphere is under snow, torrential downpours or freezing conditions, so the alternative in the case of most teams would amount to a cold and wet training camp somewhere. The other big bonus is that the teams are based in one hotel, the Adelaide Hilton, and each of the stages start and finish within a short distance from 'home'. Indeed, on some stages the racers actually ride to the start in convoy and when they do have to drive in team cars its never longer than an hour or so. It really presents as a glorified training camp with free business class flights, and those 'better' teams, who a few years ago were put off by the extreme Adelaide heat in the peak of summer, are today obliged to attend as part of the Pro Tour conditions. But I have to say that the last 20 ks of yesterday's stage in those amazing cross winds were enough to make it all worth-while to me. Graham and I had accosted the RadioShack team car to take some pics of Vaitkus collecting bidons for the rest of the team when we heard Bruynell giving him instructions that the entire team was to attack at the 15 k mark. So we hovered near the front of the peleton and waited patiently until, as expected, RadioShack gathered and pulled the chain to the point that Vaitkus and Lance rode away from the rest, breaking that invisible link. I think it was quite accidental, that they actually forced the pace so much that the two just left everyone behind and for the next 10 ks it was an amazing spectacle that pumped the adrenalin throughout my body and sent shivers up my spine. You can imagine the reaction by every photo bike, the chopper, the commissaires and the crowd when they saw the man himself doing business at the coalface of the bike race in the best way he knows. But in the end, the Columbia train took up formation to bridge the gap and drove their sprinter home hard and fast to take out the stage once more. I'm convinced Greipel is unstoppable in a bunch sprint and the only way to beat him is where the road goes uphill. Today's 5th stage took place on a huge circuit around the vineyards of the McLaren Vale and along the beaches of Aldinga but the big test was always going to be the climb up Old Willunga hill which they would need to negotiate twice before crossing the finish line.I kind of had an embarrassing start, initially getting wet in the rain on the way down from Second Valley where I spent the night, then rocking up at the finish location in Willunga instead of the new start location of Snapper Point along the beach at Aldinga. Needless to say, Graham and the other moto dudes had a few laughs on me when I finally got there 15 minutes before the race started (what a Wally)!!! To my defence, I wasnt the only one who didnt realise the change after 12 years of the same routine. The entire stage was broadcast live so it was particularly important not to do anything silly, and despite the tenacious start on my behalf, we managed to keep out of trouble and took some fantastic shots of the action including falls and every significant attack. It wasnt until the last time up Old Willunga hill that the race truly exploded however, with the rainbow jersey of Cadell Evans launching a rocketing solo escape on the windy climb. He was soon joined by three more, the spaniards Valverde and Sanchez and a 19 year old Liquigas rider with a huge future ahead of him, Peter Sagan. The break stayed away until the very end, negotiating the descent at over 100 kph. It was exciting, scary stuff to photograph as Greipel's Columbines battled to drag him within race lead parameters. They were successful in the end as he managed to keep the leader's jersey into tomorrow's final stage with an 11 second lead over Sanchez (TDU winner from 2005). Luke Roberts of Milram managed to jump the gap for second over Valverde and Evans. The race isnt over yet but I can hear the fat lady starting to warm up her voice now as it will be hard to take those 11 seconds from Greipel in tomorrow's flat circuit stage around the streets of downtown Adelaide.